This is my second visit to Melbourne, and this time I’ll be staying four weeks. The goal is to do all the stuff that you need to do to get settled: find a place to live, find a school for the kids, get a bank, find out where to buy your groceries… the basics. And, of course, to get to know this city that we have blindly chosen to be our new home for the near future. Having landed at 6:30h in the morning and passing through customs a lot quicker than anticipated, left me with a lot of time on my hands to do that last part, before the apartment would be ready. So I dropped off my baggage, took my camera and went exploring. 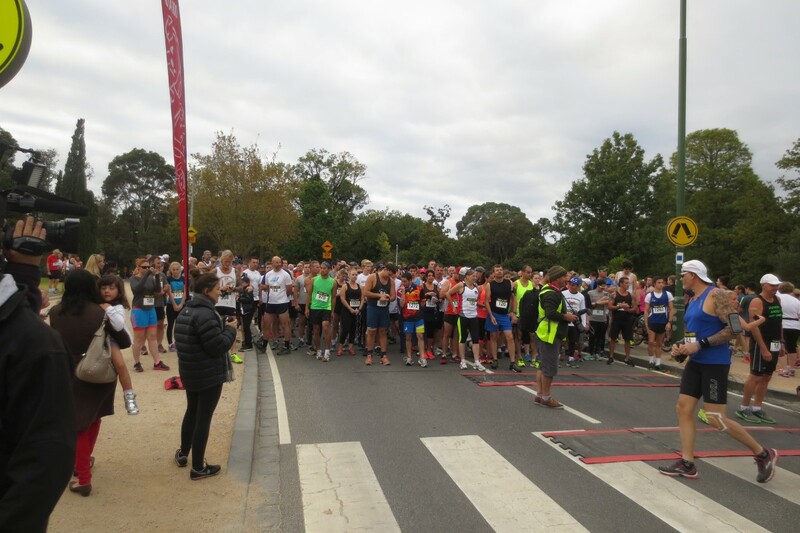 8:00am on a Sunday morning and these people are ready to do the 10km run through the park. The first thing I noticed while walking through Royal Botanic Gardens at 8:30h on a Sunday morning were runners. Lots and lots of runners. It seems that “the Australian” enjoys to be fit and outdoorsy. (It later turned out that there was actually a race on, but even so.) I continued to see lots of joggers, rowers, walkers and generally active people about so early on a Sunday. Quite a nice spot for a sit-down in the middle of the park. 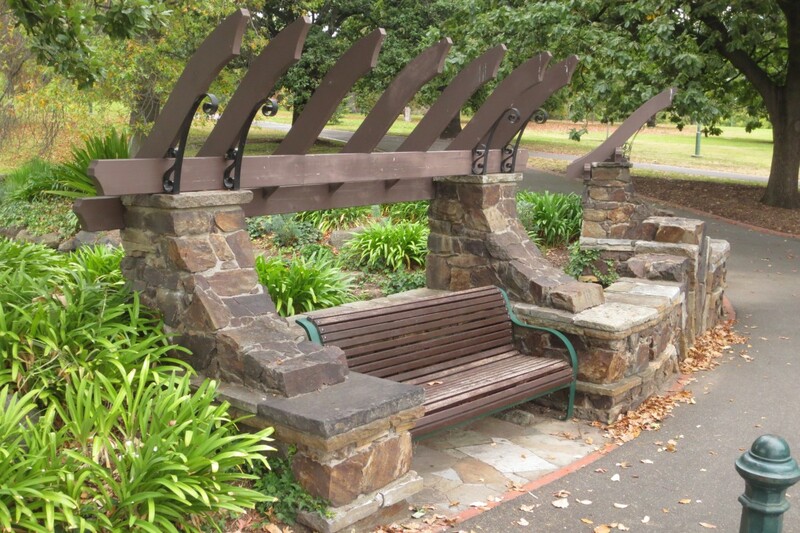 The second thing was the tranquility of the early-morning parks of downtown Melbourne. The green lounge of the city is crisscrossed with little paths, statues and public areas. And I imagine how this will look like in a few hours, when there are families sitting on these lawns, having a pick-nick and enjoying the sun. 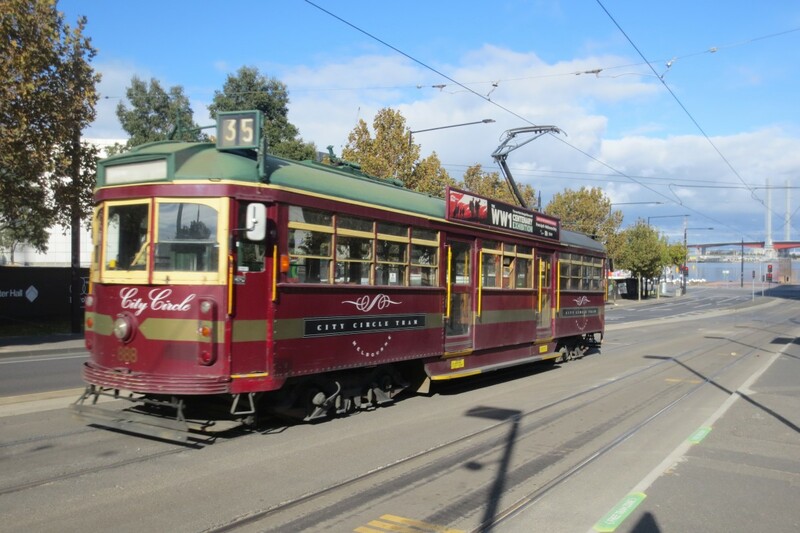 This vintage tram of route 35 will take you all around the city center. I made my way to the downtown area and spent the next few hours crisscrossing the shopping streets, having a look at the harbor and even stopping to admire St. Pauls Cathedral. I drove around a bit in the tram, which is free in this part of town. And I watched the city wake up. 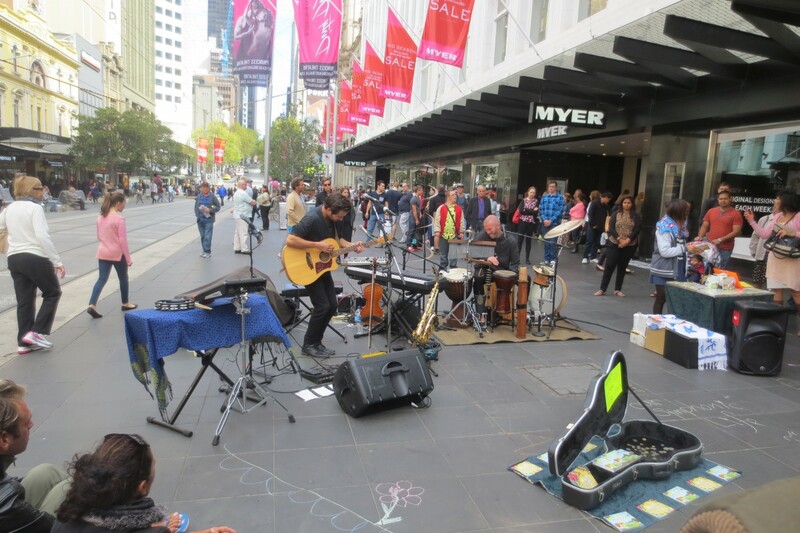 The setup of these street musicians was rather more elaborate that what you would see in Europe. And the music wasn’t bad, either. The shops open at around 10:00h and the Melbourne International Comedy Festival is going on at the moment. The streets are filled with podiums, street musicians and -performers. The weather is great and it gets busy in a hurry. Going back to the hotel I arrived there around 13:00h – pardon 1:00pm – to find my apartment is ready for me. After unpacking and getting some milk and cereal for breakfast tomorrow morning, I crashed on the bed. I think I am going to like it here.